Thanks to each of you for responding to our urgent prayer request post yesterday! Sophia perked up so much this morning. She finally ate a little breakfast and drank some fluids without us having to force it on her. She was playing happily with her brothers this morning and seems to be bouncing back wonderfully. A big change from yesterday when she wouldn't eat or drink anything and slept the whole time she was at home. The boys are still well and not showing any signs of feeling sick. We have a well check for all four of them tomorrow so I'm happy to have the doctor listen to all of their lungs to be sure we're not missing anything. We are dancing around here praising God for such a dramatic turnaround! Thanks again for your prayers. praise GOD! that is wonderful news! 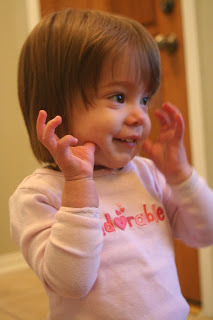 i have all of our blogger buds praying for miss sophia. God is so gracious. love you!!! Whew! I read the prayer request this morning and was so upset! I have all 4 sick right now (just a cold I think) and I know how scary that is. I'm SOOOO glad she is on the mend. So happy Sophia is acting and feeling better. What a scary ordeal. Your KS quad buddies will continue praying for a complete recovery and for continued wellness for the rest of the fam. Praising an awesome God for giving you quick answers-will continue to pray for her complete healing and continued good health for all. Much love. Glad Miss Sophia is feeling better! Prayers go out for protection over the others and Miss adorable too! I'm so glad she is better. She certainly is adorable! Thank God she is feeling better. Her sweet little self had us all so worried. We love you all and will keep on praying. Amen! I love that verse. it always chokes me up. I've wanted to put "His mercies are new every morning " up in my kitchen and I've just been inspired, once again, to get it .....from Uppercase Living. Awww she looks so sweet! I am so happy she is doing better. Just catching up on my girls. I'm assuming Sophia is all better and the boys did not catch the bug. My crew if FINALLY on the mend! Woohoo! Sure, Finn, Rub it in! Kick me when I'm down!